Are you interested in working with us? Check out our postings below to see if we have any positions that match your skills. 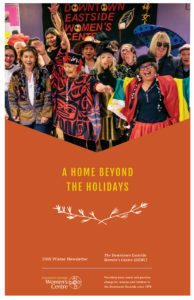 Indigenous Women and Women of Colour are Strongly Encouraged to Apply – The Downtown Eastside Women’s Centre is a Drop-In Centre and Emergency Night Shelter offering a wide variety of services to a diverse community of women and children living in the Downtown Eastside of Vancouver. The successful candidate must work from a feminist analysis and within a strong anti-oppression framework.